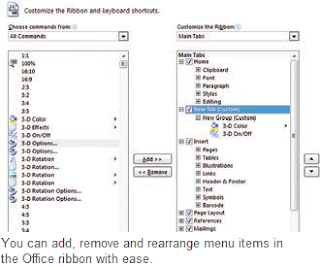 The Office Menu 2010 offers many features, but often not where you want it. However, you can customize the menu to your style of working. From version 2010 onwards, you can set up the menu in all Office applications individually. To do so, open ‘File | Options’ and click on ‘Customize Ribbon’ from the options displayed on the left. You can even customize the standard commands to a certain extent. To do so, select ‘All Tabs’ in both the combo-box sets. The section ‘Main Tab’ defines the available tabs. Individual commands are organized into groups and to display them, click on the plus sign in front of the relevant tabs. You can then move the selected group by a simple drag-anddrop action. But before that, you will have to create a new group, as you cannot add a command to the existing groups. Creating a new group is fairly simple; all you have to do is right-click at the desired place and then click on ‘New Group’. You can even rename the group that you have created. For example, in Excel, the group ‘Macros’ is in the tab ‘View’. For immediate access, you can move this to the ‘Start’ tab.